Not to be confused with Copper(I) nitrate. 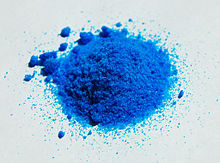 Copper(II) nitrate, Cu(NO3)2, is an inorganic compound that forms a blue crystalline solid. Anhydrous copper nitrate forms deep blue-green crystals and sublimes in a vacuum at 150-200 °C. Copper nitrate also occurs as five different hydrates, the most common ones being the trihydrate and hexahydrate. These materials are more commonly encountered in commerce than in the laboratory. Aqueous solution of copper(II) nitrate. Natural basic copper nitrates include the rare minerals gerhardtite and rouaite, both being polymorphs of Cu2(NO3)(OH)3 substance. Anhydrous copper(II) nitrate has been crystallized in two solvate-free polymorphs. α- and β-Cu(NO3)2 are fully 3D coordination polymer networks. The alpha form has only one Cu environment, with [4+1] coordination, but the beta form has two different copper centers, one with [4+1] and one that is square planar. The nitromethane solvate also features "[4+ 1] coordination", with four short Cu-O bonds of approximately 200 pm and one longer bond at 240 pm. They are coordination polymers, with infinite chains of copper(II) centers and nitrate groups. In the gas phase, copper(II) nitrate features two bidentate nitrate ligands (see image at upper right). Thus, evaporation of the solid entails "cracking" to give the copper(II) nitrate molecule. Five hydrates have been reported: the monohydrate (Cu(NO3)2·H2O), the sesquihydrate (Cu(NO3)2·1.5H2O), the hemipentahydrate (Cu(NO3)2·2.5H2O), a trihydrate (Cu(NO3)2·3H2O), and a hexahydrate ([Cu(H2O)6](NO3)2). The hexahydrate is interesting because the Cu-O distances are all equal, not revealing the usual effect of Jahn-Teller distortion that is otherwise characteristic of octahedral Cu(II) complexes. This non-effect is attributed to the strong hydrogen bonding that limits the elasticity of the Cu-O bonds. Copper(II) nitrate finds a variety of applications, the main one being its conversion to copper(II) oxide, which is used as catalyst for a variety of processes in organic chemistry. Its solutions are used in textiles and polishing agents for other metals. Copper nitrates are found in some pyrotechnics. It is often used in school laboratories to demonstrate chemical voltaic cell reactions. It is a component in some ceramic glazes and metal patinas. Copper nitrate, in combination with acetic anhydride, is an effective reagent for nitration of aromatic compounds, under what are known as "Menke conditions", in honor of the Dutch chemist who discovered that metal nitrates are effective reagents for nitration. Hydrated copper nitrate adsorbed onto clay affords a reagent called "Claycop". The resulting blue-colored clay is used as a slurry, for example for the oxidation of thiols to disulfides. Claycop is also used to convert dithioacetals to carbonyls. A related reagent based on montmorillonite has proven useful for the nitration of aromatic compounds. Wikimedia Commons has media related to Copper(II) nitrate. ^ Pass and Sutcliffe (1968). Practical Inorganic Chemistry. London: Chapman and Hall. ^ a b c H.Wayne Richardson "Copper Compounds" Ullmann's Encyclopedia of Industrial Chemistry 2005, Wiley-VCH, Weinheim. doi:10.1002/14356007.a07_567. ^ Wallwork, S. C.; Addison, W. E. (1965). "The crystal structures of anhydrous nitrates and their complexes. Part I. The α form of copper(II) nitrate". J. Chem. Soc. 1965: 2925–2933. doi:10.1039/JR9650002925. ^ a b Troyanov, S. I.; Morozov, I. V.; Znamenkov, K. O.; Yu; Korenev, M. (1995). "Synthesis and X-Ray Structure of New Copper(II) Nitrates: Cu(NO3)2·H2O and ?-modification of Cu(NO3)2". Z. Anorg. Allg. Chem. 621: 1261–1265. doi:10.1002/zaac.19956210727. ^ Duffin, B.; Wallwork, S. C. (1966). "The crystal structure of anhydrous nitrates and their complexes. II. The 1:1 copper(II) nitrate-nitromethane complex". Acta Crystallographica. 20: 210–213. doi:10.1107/S0365110X66000434. ^ LaVilla, R. E.; Bauer, S. H. (1963). "The Structure of Gaseous Copper(II) Nitrate as Determined by Electron Diffraction". J. Am. Chem. Soc. 85: 3597–3600. doi:10.1021/ja00905a015. ^ Dornberger-Schiff, K.; Leciejewicz, J. (1958). "Zur Struktur des Kupfernitrates Cu(NO3)2.1.5H2O". Acta Crystallogr. 11: 825–826. doi:10.1107/S0365110X58002322. ^ Morosin, B. (1970). "The crystal structure of Cu(NO3)2.2.5H2O". Acta Crystallogr. B26: 1203–1208. doi:10.1107/S0567740870003898. ^ J. Garaj, Sbornik Prac. Chem.-Technol. Fak. Svst., Cskosl. 1966, pp. 35–39. ^ Zibaseresht, R.; Hartshorn, R. M. (2006). "Hexaaquacopper(II) dinitrate: absence of Jahn-Teller distortion". Acta Crystallogr. E62: i19–i22. doi:10.1107/S1600536805041851. ^ Menke J.B. (1925). "Nitration with nitrates". Recueil des Travaux Chimiques des Pays-Bas. 44: 141. doi:10.1002/recl.19250440209. ^ Balogh, M. "Copper(II) Nitrate–K10 Bentonite Clay" in Encyclopedia of Reagents for Organic Synthesis (Ed: L. Paquette) 2004, J. Wiley & Sons, New York. doi:10.1002/047084289. ^ Collet, Christine (1990). "Clays Direct Aromatic Nitration". Angewandte Chemie International Edition in English. 29: 535–536. doi:10.1002/anie.199005351.